A carbohydrate is a biological molecule consisting of carbon (C), hydrogen (H) and oxygen (O) atoms, usually with a hydrogen:oxygen atom ratio of 2:1 (as in water); in other words, with the empirical formula Cm(H2O)n (where m could be different from n). Some exceptions exist; for example, deoxyribose, a sugar component of DNA, has the empirical formula C5H10O4. Carbohydrates are technically hydrates of carbon; structurally it is more accurate to view them as polyhydroxy aldehydes and ketones. The term is most common in biochemistry, where it is a synonym of saccharide, a group that includes sugars, starch, and cellulose. The saccharides are divided into four chemical groups: monosaccharides, disaccharides, oligosaccharides, and polysaccharides. In general, the monosaccharides and disaccharides, which are smaller (lower molecular weight) carbohydrates, are commonly referred to as sugars. The word saccharide comes from the Greek word σάκχαρον (sákkharon), meaning "sugar." While the scientific nomenclature of carbohydrates is complex, the names of the monosaccharides and disaccharides very often end in the suffix -ose. 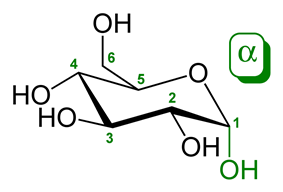 For example, grape sugar is the monosaccharide glucose, cane sugar is the disaccharide sucrose and milk sugar is the disaccharide lactose (see illustration). 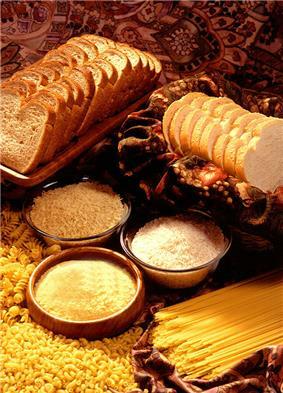 Carbohydrates perform numerous roles in living organisms. Polysaccharides serve for the storage of energy (e.g., starch and glycogen) and as structural components (e.g., cellulose in plants and chitin in arthropods). The 5-carbon monosaccharide ribose is an important component of coenzymes (e.g., ATP, FAD and NAD) and the backbone of the genetic molecule known as RNA. The related deoxyribose is a component of DNA. Saccharides and their derivatives include many other important biomolecules that play key roles in the immune system, fertilization, preventing pathogenesis, blood clotting, and development. 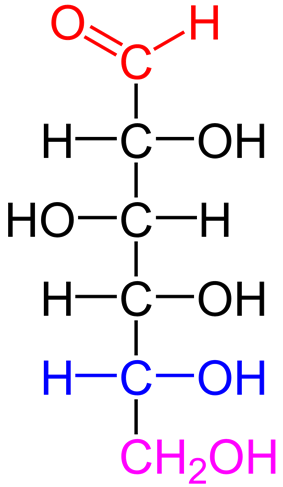 Formerly the name "carbohydrate" was used in chemistry for any compound with the formula Cm (H2O) n. Following this definition, some chemists considered formaldehyde (CH2O) to be the simplest carbohydrate, while others claimed that title for glycolaldehyde. Today the term is generally understood in the biochemistry sense, which excludes compounds with only one or two carbons. Natural saccharides are generally built of simple carbohydrates called monosaccharides with general formula (CH2O)n where n is three or more. A typical monosaccharide has the structure H-(CHOH)x(C=O)-(CHOH)y-H, that is, an aldehyde or ketone with many hydroxyl groups added, usually one on each carbon atom that is not part of the aldehyde or ketone functional group. Examples of monosaccharides are glucose, fructose, and glyceraldehydes. However, some biological substances commonly called "monosaccharides" do not conform to this formula (e.g., uronic acids and deoxy-sugars such as fucose) and there are many chemicals that do conform to this formula but are not considered to be monosaccharides (e.g., formaldehyde CH2O and inositol (CH2O)6). The open-chain form of a monosaccharide often coexists with a closed ring form where the aldehyde/ketone carbonyl group carbon (C=O) and hydroxyl group (-OH) react forming a hemiacetal with a new C-O-C bridge. Lactose, a disaccharide composed of one D-galactose molecule and one D-glucose molecule, occurs naturally in mammalian milk. 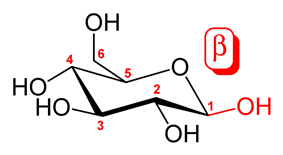 The systematic name for lactose is O-β-D-galactopyranosyl-(1→4)-D-glucopyranose. Other notable disaccharides include maltose (two D-glucoses linked α-1,4) and cellulobiose (two D-glucoses linked β-1,4). Disaccharides can be classified into two types.They are reducing and non-reducing disaccharides. If the functional group is present in bonding with another sugar unit, it is called a reducing disaccharide or biose. Carbohydrate consumed in food yields 3.87 calories of energy per gram for simple sugars, and 3.57 to 4.12 calories per gram for complex carbohydrate in most other foods. High levels of carbohydrate are often associated with highly processed foods or refined foods made from plants, including sweets, cookies and candy, table sugar, honey, soft drinks, breads and crackers, jams and fruit products, pastas and breakfast cereals. Lower amounts of carbohydrate are usually associated with unrefined foods, including beans, tubers, rice, and unrefined fruit. Foods from animal carcass have the lowest carbohydrate, but milk does contain lactose. Carbohydrates are a common source of energy in living organisms; however, no carbohydrate is an essential nutrient in humans. Humans are able to obtain most of their energy requirement from protein and fats, though the potential for some negative health effects of extreme carbohydrate restriction remains, as the issue has not been studied extensively so far. However, in the case of dietary fiber – indigestible carbohydrates which are not a source of energy – inadequate intake can lead to significant increases in mortality. Long-chain fatty acids cannot cross the blood–brain barrier, but the liver can break these down to produce ketones. However the medium-chain fatty acids octanoic and heptanoic acids can cross the barrier and be used by the brain, which normally relies upon glucose for its energy. Gluconeogenesis allows humans to synthesize some glucose from specific amino acids: from the glycerol backbone in triglycerides and in some cases from fatty acids. Organisms typically cannot metabolize all types of carbohydrate to yield energy. Glucose is a nearly universal and accessible source of dietary fiber. Fiber enhances digestion, among other benefits. ^ Joint WHO/FAO expert consultation (2003). (World Health Organization. pp. 55–56. ISBN 92-4-120916-X. The most important carbohydrate is aerobic respiration metabolize glucose and oxygen to release energy with carbon dioxide and water as byproducts. Carbohydrate metabolism denotes the various organisms.